If it has happened to you in the past you are a rare beast. Statistics tell us that 99% of luggage arrives safely at its destination. Which is incredible if you think about it. I always look at my suitcase trundling down into that Neverland of suitcase mayhem and wonder if I will ever see it again. I get to the other end (of the world) and lo and behold there it is! It’s a miracle. Not so much fun is losing your bag – forever! Yes we have all had baggage delays and then that nice man from Calgary airport arrives at the front door at 11 pm a couple of days later with the missing bag. But what about when it disappears completely? What happened? Did the baggage tag fall off? Did your address label tear? You know you should have bought the sturdy leather one and not rely on the last-minute paper labels at the check in counter. And you do realise you should have put your name and address inside your suitcase? Otherwise how will they ever know it’s your bag? Another problem is filling in the form for the lost baggage. 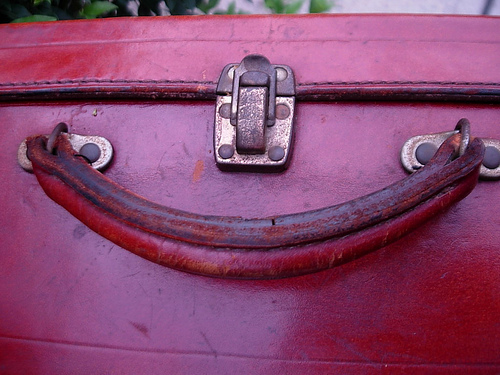 Can you remember actually what colour or make your suitcase was? I know I couldn’t. 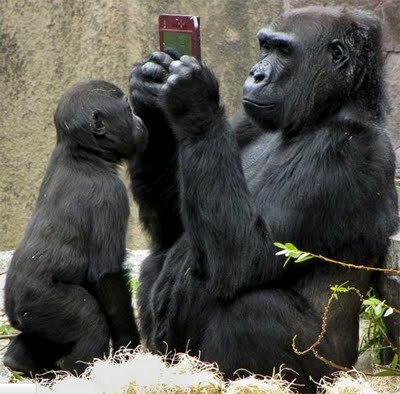 Mmmm – did I take the red one or the black one this time? Did it have two wheels or four wheels? Maybe the best thing is to have such a distinctive bag that it really stands out in a crowd. And talking about crowds…. what is it with the baggage carousel? 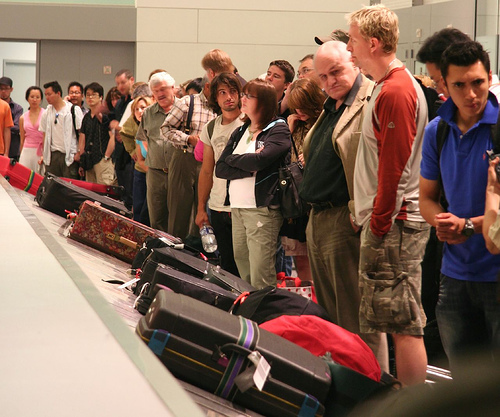 People stake their claim to a place right in the front leaving the late arrivals bobbing around trying to peak between shoulders to see if they can identify their bag. Then when you do see your bag you have to rugby scrum your way through the crowd to get to it before it scoots along the line and disappears down the hole again! Your bag is not there yet! So eventually when your unidentified suitcase lands up in the warehouse someone has to go through the contents to see if there is a way of identifying the owner. Not a nice thought. Remember that next time you cram all your dirty washing in a plastic bag. Imagine that after a few weeks in a warehouse in Barbados! I guess you could come away with some great bargains – including wedding gowns! Imagine how mad that bride was…..I wouldn’t like to be the airline representative for that airline! Mind you – some wedding dresses might be better off lost for ever…..
Having grown up in England I have passed Stonehenge many times on long family car trips and even visited a couple of times. That was in a time when access to the famous stones was easy and free. Now of course, as Ms Morse points out, the stones have to be protected from tourists chiseling off lumps as souvenirs – which is a shame. Don’t they know that the stones are protected by ancient Druid spells ??? I must confess I am guilty here. Having visited family in Ireland many times I have always shunned a visit to the Blarney Stone in favour of the roads less travelled. Instead of the Ring of Kerry we did the Dingle. Instead of Killarney we did Doolin. Even there we failed to escape the weekend hoards from England who just wanted a good pub with all the atmosphere of Irish craic so that they could shout themselves hoarse and get drunk as quickly as possible. I felt so sorry for the musicians and singers trying to compete with a bunch of yobs like that. My tip – visit Doolin known as the capital of Irish traditional music – but go midweek when the yobs are at work. However touristy it was (and it is) I just had to visit the pyramids at Giza. I even made the awkward and crippling climb up into the burial chamber in the middle of the pyramid. There’s nothing to see when you get there. So why go? Why climb Everest? Because it’s there. And I have to confess I committed the mortal sin of all tourists – I had my photo taken sitting on a camel. What a fraud I am. 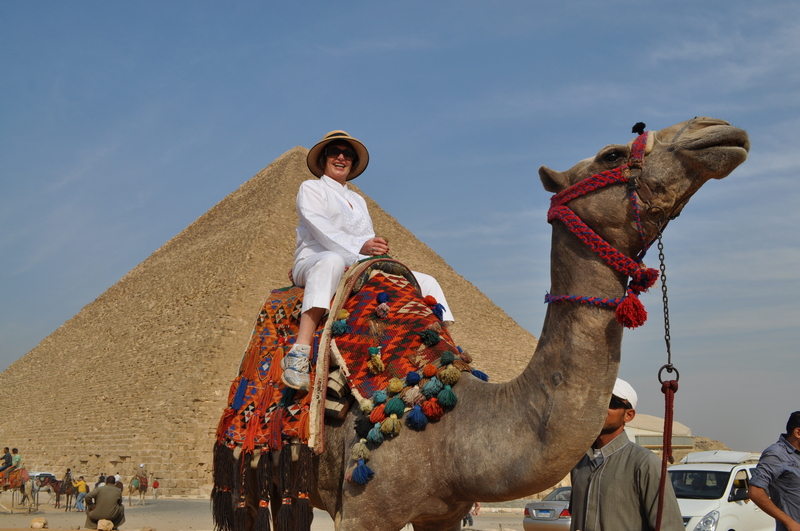 I didn’t want the damn thing to move – it was bad enough getting up on it screaming and yelling (the camel that is – not me) with filthy breath (again – the camel not me). But I did my touristy thing and even got teased by our Egyptian guide. “Well done” he said to me when I climbed off. “Now you can say you came to Egypt and behaved like a Japanese tourist.”…. Ouch! I only saw this in the distance after visiting Lucca instead. If you are in the area you will probably enjoy Lucca much more with its cobbled streets and coffee shops. It is a working walled medieval town and my time there was too short. Would love to go back for a few days. Then maybe I would go and see the Tower – but maybe not. I think I AM a tourist. I quite enjoyed the clock. Sure there is a bit of a crush when the appointed hour draws near but it is a beautiful building and lovely to see the clock in action. Then you should go up the clock tower. 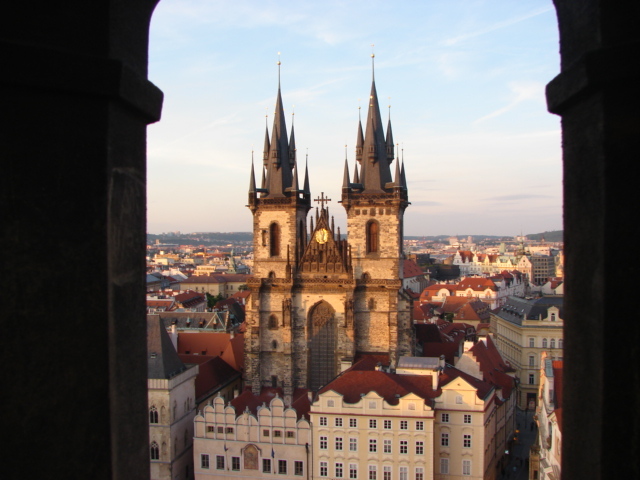 There is an elevator inside and for a fee you can go right to the top for the most amazing views over Prague. Do this just before sunset for incredible photos. I agree totally – nothing of any value to see or do there. Been there, done that – didn’t enjoy it. This particularly dirty part of California leaves me mystified as to why people go there and why I went there. But I did and I will never get that time back again! Yes I know that sounds like sacrilege but it’s true. Unless you have seen Ancient Egypt you ain’t seen nothing yet. How come you can visit tombs in the Valley of the Kings in lower Egypt where the paint is still fresh and vibrant looking after 3000 years…. And today we can’t get a paint job for the house that will last at least 10. It’s mind-boggling. Let’s consider – the ancient Egyptians were working on sophisticated engineering projects like the pyramids, irrigation, surgical instruments and the use of medicinal herbs while our ancestors (North American / European) were living in caves wearing animal skins. Makes you think? If you have a fascination for ancient history – for all things related to what we are today as human beings and how we developed – then Egypt has to be the next place to visit. Put this country on your bucket list. There are more important archeological and ancient historical sites in this country than Tim Hortons locations in Canada. Another very good reason to visit now is that the Canadian Government has lifted the travel ban for Egypt. The Arab Spring brought democracy to Egypt but it also brought a swift decline in tourism numbers. Hotels, river cruise operators and tour guides have all suffered through this decline but savvy tourists who visited the country over this time experienced almost private experiences at the pyramids, the tombs and the temples. Consider the numbers – before the Arab Spring over 200.000 visitors a day arrived at sites such as Luxor and the Valley of the Kings and Queens. To enter some of the tombs you might feel as if you were at DisneyWorld without an express pass with wait times in line ups of up to 45 minutes for each tomb. Your photographs of famous sites such as the Temple of Edfu might resemble Times Square on New Year’s Eve due to the number of people visiting. My experience was very different. Although there was a fair number of tourists our guide made sure we were up early every morning to get out to the sites in order to be the first people there. I was able to wander around the terraces of the temple grounds and feel that I was the only person there. A real opportunity for wonder and reflection. Some tombs cost a little extra to visit – for example the tomb of King Tutankhamen. Just four of our group decided to fork out the extra $16 to see his tomb. Wow – now that was an experience. The original mummy is there in a sealed glass case. My husband and I dawdled and the other couple left the tomb. We just couldn’t believe that we were experiencing a private viewing of King Tut. Priceless! Another reason to go now….. plans are afoot to close the original King Tut tomb and replace it with a replica. There has just been too much damage and the concern is that they want to protect these incredible ancient wonders. Some tombs are already closed to the general public and not accessible with your permit to visit the Valley of the Kings. You can still visit these tombs but it will cost …. Some permits cost in the region of $3000 a visit. Apart from the pyramids and the tombs and temples you will be charmed by the Egyptian people. They take hospitality to a whole new level and I can honestly say that I felt like an honoured guest wherever I stayed. Yes it’s hectic and the traffic in Cairo is a nightmare, the streets are dirty, the muezzins call to prayer will wake you at 5 am, the street vendors are persistent in their extravagant compliments as to your smile, your hair, your eyes – anything for a sale. I loved it….. and I will return. Next Christmas I am definitely heading out of town – somewhere hot would be nice. A beach, a margarita and Feliz Navidad would suit me just fine. I know it is a crazy time to travel – that’s what I tell my clients. Everything is overpriced and overcrowded. Airline staff are grumpy, baggage handlers unreliable and there is not a spare seat on the plane. At the beach you can forget about getting a beach chair without at least bribing ten people first and if you are at one of those all inclusive resorts where the speciality dining requires reservations that morning – good luck with the queue. So why would I put myself through that hell rather than stay at home in this “lesser hell” of crowded shopping centres, crying children and excesses of spending, eating and drinking? You see, Christmas just doesn’t seem the same any more. I know, I know – I am not 6 years old any more and if I had to line up and sit on Santa’s knee at the shopping centre – well let’s not go there. I honestly don’t think I am going to find anywhere in the world that hasn’t fallen victim to the Christmas Commerce Bug. Even in Hanoi and Siem Reap Christmas trees popped up on every corner and shops were lavishly decorated in Saigon with wintry scenes of sleighs and frosty trees. I guess if I really want to escape it altogether I might find a corner maybe in Papua New Guinea or in Nepal? Any ideas or recommendations would be welcomed. In the meantime I will busy myself with taking down the Christmas tree. Funny how everyone wants to help with putting the damn thing up – no-one ever wants to pack it away. That’s OK – I am in the right job to spend a whole year dreaming and planning for a Christmas where Santa won’t be….. I know! The North Pole. Not exactly a beach but hey – maybe I get to see some polar bears – now that would be cool! If you like Attitude (capital A please note) take yourself on a trip to New York. Yes people. New York New York – the Big Apple – the city that never sleeps. Here’s an idea. Don’t stay in Times Square or in the Village or on Park Avenue. If you want to meet the real New Yorkers go stay on the upper West Side where people actually live and play and shop and go buy kosher bagels and yummy lox cream cheese. These people take life seriously and don’t mind giving you their opinion. Take Nick – well Big Nick as he is known. His restaurant/diner whatever is in the ‘hood. To find a table there you might have to take a wander through the kitchen and past the storeroom. 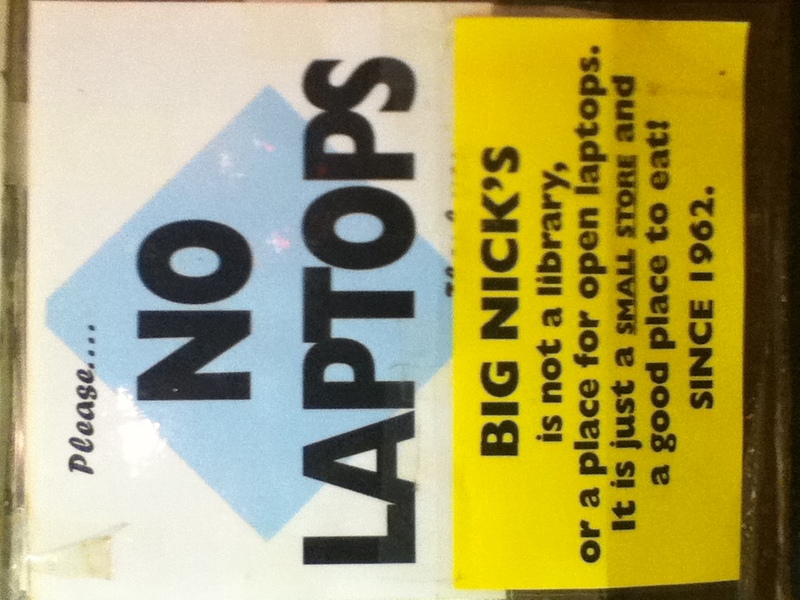 This ain’t no Starbucks and Nick makes that abundently clear with a large sign “No laptops – this is a restaurant, not a library”. New York was full of surprises. The subway was amazingly efficient, easy and cheap and we used it until late at night. Wall Street was so tiny – disappointing really considering its influence. Times Square was unbelievably tacky and somehow strangely thrilling. A visit to the mega store My American Girl was extremely disturbing – they specialise in expensive 18 inch dolls chosen to look like the little girl owner with matching outfits and even a hair salon upstairs – for the dolls not the kids. Yes grown women paid to stand behind a counter and braid a doll’s hair or give it a manicure or pedicure. Bizarre. I found it rather sickening in today’s climate of starving children in Somalia – but I grow morose….. The best part of New York was Little Italy. Now shrunk to just one street – but what a street. We nearly didn’t find it but after wandering around Chinatown and getting directions a couple of times we turned the corner and there it stood – oh wow. Pretty lights in the street, tables and chairs laid up with check cloths and candles and even serenading musicians. A wonderful evening. So go to New York and enjoy all of it – its vulgarity, its charm, its vibe and mostly its people – it should be called the Big Heart rather than the Big Apple. Now I feel sorry for the donkeys, don’t get me wrong. 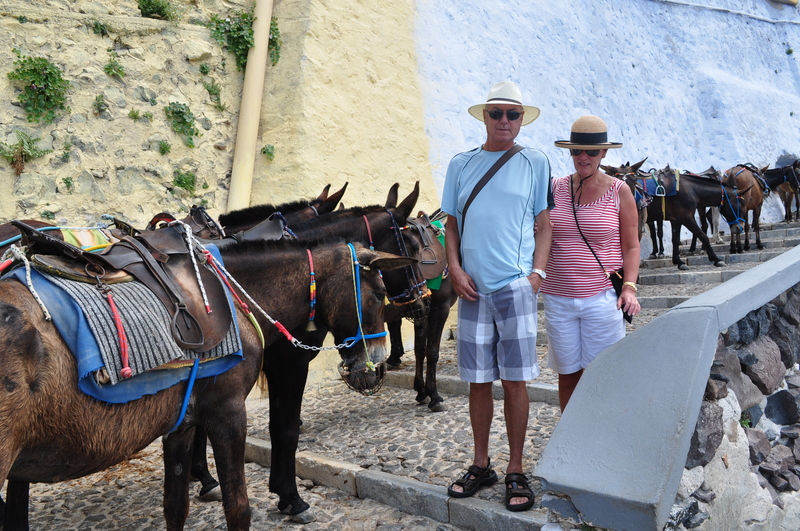 But I know where the mule part comes from and when you are negotiating a steep rocky path from the top of Santorini down to the ferry station everyone is fighting for territory. Maybe we should have taken the gondola – we did have the tickets after all – but the line-up was horrendous so we thought we would be clever and walk down. What we didn’t realise before we started was that the rocks on the path were polished smooth by the thousands of people (and donkeys) who have gone up and down this path. In addition to this they were well oiled by liberal doses of donkey poo. I was halfway down the path ahead of my sister when I realised that she was in a confrontation with a donkey. Unable to move and squashed up against the side of the wall by the donkey she burst into tears so her husband had no option but to punch the donkey in the neck. Now before you go all PETA on me it hurt him a lot more than it hurt the donkey. Trust me – his hand was red for days. Any idea when these cruise ships go away? The problem was of course that there were no less than 7 cruise ships in the harbour. Imagine pouring out all those passengers into the tiny streets of Santorini. The people pressure was unbelievable and I was told that 11 ships were expected the next day. What a shame. It is indeed a beautiful island with stunning little hotels literally hanging onto the side of the cliffs. My best bet – if you really want to see Santorini go in October, sleep late, eat lunch at the pool of your hotel and then by 4 pm you should be safe to venture out and enjoy the island as it was meant to be enjoyed. After seeing Monemvasia I am sure there are many such undiscovered and beautiful places to visit in Greece and I plan to find them. Stay tuned! Preferably somewhere without a donkey ride involved!